I was lucky enough to come down to Tampa for this weekend. I am currently typing this from Steinbrenner field. The panorama above was taken on my iPhone. I also posted the pic on the CRM software site - that's Customer Relationship Management software for those unfamiliar. Colon is startingthe game, with Prior and Banulous pitching after. Update 6:48- Jeter, Cano and Posada just took the field. Baseball is just getting started, but basketball is in its final stretch of regular season games. As you all know, the Knicks added superstar Carmelo Anthony along with Chauncey Billups in a three team swing at the deadline. New York gave a large amount of talent to move Melo to the Garden, but a closer analysis of the players given makes this an ideal trade. The Knicks were coming off a disappointing lose to Cleveland where they looked lethargic. The win over the Heat tonight give Knicks fans a glimmer of hope. Defeating one of the elite teams in the East is a morale boost for any organization, especially after adding new pieces. The Knicks don't have time to let their offense come together. They need to continue to work hard to make this work, if they want to make a playoff run. Superstars like Melo and Amar'e are going to need to play defense and rebound, like they did tonight, in order for the Knicks to contend. Mike D'Antoni is still trying to figure out lineups with his new players. During Sunday's game he was trying several different match-ups. He needs to figure out which lineup can work together well depending on the situation. I was impressed with Anthony Carter's performance tonight. He is a quick defender who is always snatching at the ball. He did not look too good from three point range, however. 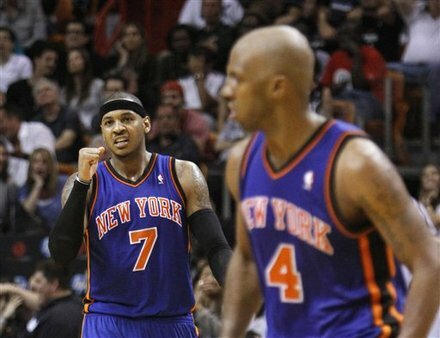 Carmelo put the situation perfectly, "We redeemed ourselves. We're not where we want to be yet. We've got a long ways to go." Tomorrow the Yankees will be pitching C.C., Prior and Banuelos, but you won't be able to watch since the game won't be televised and will not be on MLB.TV. Interesting fact: Prior made his first MLB pitch to Joe Girardi, who is now his manager. The Knicks came up with a big win over the Heat tonight in Miami. MLB 11 The Show demo is available for download. The game will be released March 8th. If you pre-order the game you get 30 days of MLB.TV free. The baseball word grieves over the death of Duke Snyder. The news that Jets fans have been waiting to hear since the start of training camp. Our prized player, the coolest cornerback in the league, Darelle Revis, is close to signing. There have been whisperings all night of a meeting between my boy Darelle's agent meeting with the Jets tonight to lock this thing up. Some other writers have been shooting this down, which gives the impression that no one knows what the hell is going on. Before Jets fans start running around town causing havoc this is NOT DEFINATE but when there is smoke there is usually fire and this one is burning up. My personally opinion is that the Jets knew what would get Darelle signed, they waited until Hard Knocks was about to air so that the show could help break the news. They will be painted as the good guys and Revis will be back. I have a gut feeling on tonights Hard Knocks you will see Revis become a Jet for life. This media blackout may have actually helped get the deal done but the downside is that the public is in the dark. Since the baseball season is in it's home stretch everyone starts talking about awards. C.C. Sabathia is looking like a front runner in the A.L. Cy Young race. The interesting race to follow this season will be the 2010 A.L. MVP. There are four hitters who can make a claim to the prestigious award: Josh Hamilton, Miguel Cabrera, Adrian Beltre and Robinson Cano. Joe Mauer has the average and OBP to be in the running but I booted him out due to his small power numbers this year, like his .487 slugging %. When you take a look at the stats you think Hamilton should win due to the large lead he has in the Batting Average category. Then you look at Cabrera's power numbers in awe and think he should lock it up due to his Homers, RBIs, OBP, and SLG while still keeping a high average. Miggy playing for Detroit will deter him from winning this award, I guarantee it. Even though Hamilton and Miggy are leading Cano in almost every common statistical category he is still my pick for MVP on MVP and here are my reasons why. First of all WAR. WAR stands for Wins Above Replacement which is a statistic that presents the number of wins that the player added compared to what a replacement player (think a AAA or AA player) would add. This stat shows Cano's value to the in hitting, fielding and base-running expressed in wins. Though Cano isn't leading the league in any common statistics such as Average but he is leading the league in WAR by a good margin. The MVP award is about your individual performance benefiting your team and adding 6 and 1/2 wins to the Yankees really jumps out. Fun Fact: Cano has hit 23 of his 25 home runs in games that Yankees have won. Cano is batting .311 with RISP as well. MVP stands for most valuable player not most valuable hitter. Defense is usually discounted when the MVP is talked about. From the three players in the running you already know- from watching baseball- that Cano is the best defender of the group. Playing on the best team in baseball helps Cano's MVP bid. In a season where the Yankees two best hitters, A-Rod and Teixeria, started off cold Cano picked up the slack. He is one of the main reasons the Yanks have the best record in baseball. If Cano reverted to another 2008 like season the Yankees would be struggling with Boston right now for the Wild Card. Cabrera and Hamilton are both playing positions where most of the elite hitters in the game play, Outfield and 1st base. Cano is a second baseman. Think about some other second basemen in the leauge, the only one that can compare to Cano's hitting prowess in baseball is Utley. You can make the argument for Pedroia but you have to be above 6.0 ft to be considered on my site (and he is hurt this year so stop crying). I hope the bold text on the main points helped people who liked to skim but now I've got you, go back and read the whole thing! Anyway it seems pretty simple to me that Cano should be this year's MVP but hell if Dustin Pedroia can win it anyone can. "Revis and Jets announce new deal, probably Wednesday. You heard it here first. 'Inside information!'" The Jets and the All-Pro center are closing in on a long-term contract extension that could be announced as early as tomorrow or Tuesday, according to a person with direct knowledge of the negotiations. Terms of the deal are still being finalized, but it is expected to be a mega-deal topping the five-year, $37.5 million contract St.Louis’ Jason Brown — the league’s highest-paid center — signed last year. This seems to be the right move by Mike Tannenbaum since Mangold showed up to camp. Just because the Jets and Nick are close to a deal doesn't mean that Cowlishaw's news about Revis is complete bull. My quiet day ended when I obtained some information early in the afternoon about Darrelle Revis, the Jets’ fabulous cornerback who has been holding out from camp in order to get a new contract. The source of information was good, someone I have used before. Beyond that, I won’t go into further details. Originally I was told the signing would be “probably Wednesday or Saturday.” That seemed strange that there would be a possible range of three days in the situation. Even limiting myself to that, “probably Wednesday” sounded weird, like I was hedging my bets. I wasn’t trying to suggest there’s a deal-breaker involved, but who knows? Things of that nature happen all the time. Still, I felt like “probably Wednesday” was the most accurate information I could provide at the time. Once that one tweet was out there, my chances of getting much of the day off were shot (although I did manage to squeeze in three games at Top Golf with Ben and I didn’t forget to skype Rachel). It didn’t surprise me that my information was getting shot down right and left by those covering the Jets. As a beat writer covering the Cowboys for six years, I did a lot of “shooting down” and this was in the early days of ESPN and long before the world was wired and Twitter came along. I talked to ESPN’s Chris Mortensen and the New York Daily News‘ Gary Myers on the phone, a couple of guys I have known for 20 years or more. I exchanged texts or, in some cases, tweets with others I have had long relationships with. They were supportive if curious as to how this information was coming from a Dallas-based general columnist. Understandably curious. As for those who said I was making it up to get more followers: Does that sound like a good thing to do? I’ve worked for The Dallas Morning News for more than 20 years, ESPN for another seven. Is just making stuff up and having no clue about it a big part of my history? Getting predictions wrong, yeah, I’ve done that two or three times. Two or three thousand times, I mean. Throwing stuff against the wall with no idea whether or not it might stick? Not a real good way to maintain any shred of credibility. The messages coming in from Jets’ fans were pretty much non-stop and the only surprising thing about any of that was how many of them seemed to suggest they didn’t think Revis would sign until well into the season, if at all. How often does that happen? How often does that work? Emmitt Smith got extra guaranteed money by sitting two games in 1993. But that was the league MVP-to-be and he had to get somewhat lucky in rolling the dice that the Cowboys would go 0-2 to Washington and Buffalo and that Coach Jimmy Johnson would go so crazy about it that Jerry Jones would have no choice but to cave in. As great a player as Revis is, that’s a big gamble to take. Regardless, it does not appear that he is going to roll those dice. All signs indicate that the Revis saga, a major storyline for HBO’s Hard Knocks‘ special on the Jets, ends this week. And then I can tweet more about Shadow of the Wind by Carlos Ruiz Zafon … even if it doesn’t quite reach the same audience that Darrelle Revis does. Revis Island should return for the season. Now after reading this post Cowlishaw really thinks that his source it right. I think they will announce Mangold's deal before Revis' but they still may be making progress with both. This is great news for Jets fans like me. C.C. Sabathia is tied for the most wins in baseball with 17. He is the best pitcher in baseball right now in my opinion and would have my Cy Young vote. Of course C.C. 's numbers are impressive but what really jumps out are his stats at home. Sabathia is 9-0 at home this season. This season his home ERA (2.64) is a whole point lower than his away era (3.55). With around 7 starts left in the regular season for C.C. it seems almost definite that he will lock up 20 wins for the first time in his career. Labels: CC Sabathia, the notorious C.C. A-Rod is being put on the DL and Ivan Nova is being called up to pitch on Monday. We are going to be seeing more of Nunez.